This is our annual interior design review of offices. 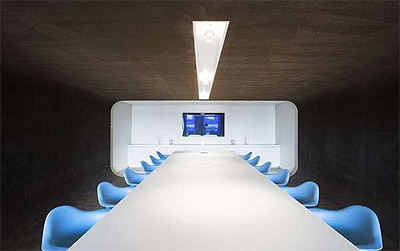 Today I'd love to share some of the most intriguing offices around the globe. If you are thinking about remodeling your office or if you are moving your office to a new location, these are great examples of what your office can look like with a bit of imagination. If you need help implementing your ideas into reality, you can always e-mail us or simply fill out this form to start the conversation. In our Green News corner, learn a few reasons why we feel so comfortable when surrounded by rustic design elements in our interiors. If you missed our last month's newsletter on what made Pinkberry Frozen Yogurt Shop a big success, take a look HERE. Also learn how to make your office a happier place by following the 5 simple steps listed HERE. I hope today you will get inspired to do something really creative in your office this year! Selgascano, a Spanish design firm, located their new studio in the middle of the woods outside of Madrid. The whole building is shaped as a one-story pipe or a tunnel hiding among tall trees and grass. Half of the curved roof, the side facing north, is transparent and allows the sunlight be the natural illumination for the office occupants. The bottom part of the “tube” is below the ground level, which makes the desks almost level with the grass. Read more HERE. Skype found its next Stockholm home in a recently restored historical building, Münchenbryggeriet, which is also a well-known landmark of Stockholm’s skyline. In 1846 the building was built as a clothing factory, and in 1857 it became Sweden’s largest brewery until 1971. It is now Skype’s offices and the München Brewery houses 100 employees. 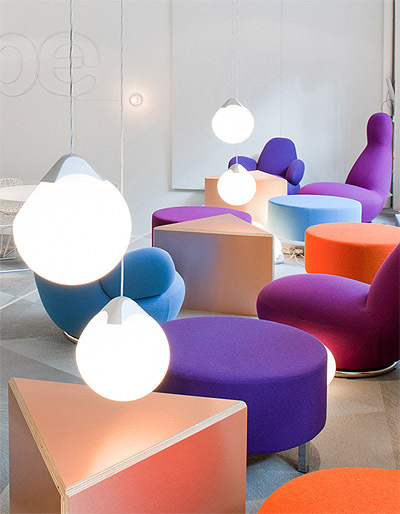 PS Arkitektur firm, the designer of this fun office, was inspired by Skype brand’s playful spirit and its mission to connect the world. Read more HERE. 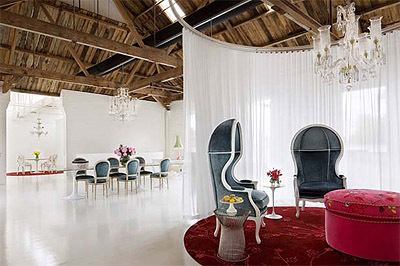 This once run-down Melbourne warehouse has been transformed into the dreamy world of a fashion label Alannah Hill by a very talented architect David Hicks. The shell of the warehouse had to be structurally upgraded, but the feel of the old building has been retained. The designer brought together the incredible combination of the old industrial structure - the ceiling trusses, exposed brickwork and giant barn doors - with the softness and fun of the interior furnishings. Read more HERE. Take a look at what Stuart Stadler Architects had in mind for this 5,000 s.f. space inside of the historical Das Preysing Palais, a late Baroque masterpiece in Munich on 27th Street. In contrast to the restored baroque, the new interior is very modern with sophisticated lighting, texture, colors and furniture. Read more HERE. Perhaps one of the most difficult tasks for a design firm is to design your own office. 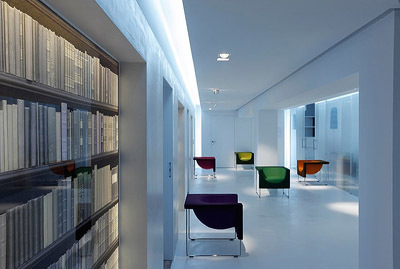 What would you create if you were one of the most creative Holland design firms? Maurice Mentjens Design is a creative design and animation studio in Holland. Take a look how they resolved this difficult task. Read more HERE. Are you thinking about making architectural changes in your business? Contact us HERE! See other office design ideas HERE. 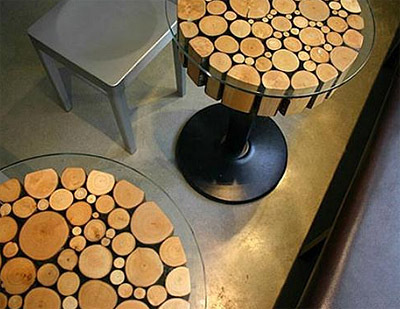 The elements of rustic design appeal to many people at first sight, as well as on a deep, subconscious level. I find that earthy spaces with natural decor materials draw folks in, whether it’s into a lodge in the mountains or into bustling New York City apartments or hotels. The visual qualities created by rough, unfinished wood, flowers and other plant materials, and touches of naturally weathered metals, can lend a sense of peace and bring back thoughts of childhood moments spent outside enjoying the natural world. I remember walking through the woods next to a stream and exploring for hours on end as a child, but have not engaged in such activities for years because of hectic schedules and family and business obligations. Read more HERE.